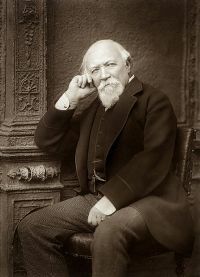 Robert Browning (May 7, 1812 – December 12, 1889) was an English poet and playwright who, along with Alfred Lord Tennyson is perhaps one of the most well-remembered poets of the Victorian era. Browning lived in a time of transition in British poetry; the great sweep of Romanticism had reached its end, and it would be some decades well after Browning's death before the new excitement of the modern would burst onto the poetic scene. This period of interregnum in English literature would become dominated by poets attempting to transmute the wild energy of the Romantic age into new and tempered forms. Despite this reputation, much of the great advances and revolutions in poetic thinking that would sweep the world beginning in the twentieth century had their genesis in the Victorian era, and one of the greatest poets of this age was Browning. Browning was influenced strongly by Percy Bysshe Shelley, and in particular Shelley's lengthier dramatic poems such as Prometheus Unbound, which inspired him to the dramatic poetry which would ultimately cement his own reputation. Browning was an accomplished lyric poet, but he would be famous (and, for a time, notorious) for his insistence on vast forms. Browning’s most famous and infamous works, Sordello, Men and Women, and The Ring and the Book, are all mammoth volumes of narrative, sharing perhaps as much in common with John Milton, Geoffrey Chaucer, and William Shakespeare as they do with the poetic fashions of Browning's own times. Although he was severely underrated by his immediate successors in the twentieth century, Browning's impact on the evolution of poetic narrative is significant. His narrative poetry and his influence on the tone and style of modern poetry impacts deeply the epics of T.S. Eliot and William Carlos Williams as well as the Confessional School of the latter twentieth century. Although it had largely fallen out of favor in the mid-nineteenth century, Browning was one of the key pioneers in revitalizing dramatic poetry. Browning was born in Camberwell, England, on May 7, 1812, the first son of Robert and Sarah Wiedemann Browning. His father was a man of fine intellect and equally fine character, who worked as a well-paid clerk in the Bank of England and so managed to amass a library of around six thousand books—many of them highly obscure and arcane. His mother, to whom he was ardently attached, was a devout nonconformist, the daughter of a German ship owner who had settled in Dundee, and was alike intellectually and morally worthy of his affection. The only other member of the family was a younger sister, also highly gifted, who was the sympathetic companion of his later years. They lived simply, but his father encouraged Robert's interest in literature and the arts. In his childhood he was distinguished by his love of poetry and natural history. At 12 he had written a book of poetry which he destroyed when he could not find a publisher. After attending one or two private schools, and showing an insuperable dislike to school life, he was educated by a tutor. He was a rapid learner and by the age of fourteen was fluent in French, Greek, Italian, and Latin as well as his native English. He became a great admirer of the Romantic poets, especially Percy Bysshe Shelley. In imitation of the latter, he briefly became an atheist and a vegetarian, but in later life he looked back on this as a passing phase. At age sixteen he attended University College in London, but dropped out after his first year. In May 1833, Browning's Pauline: A Fragment of a Confession was published anonymously by Saunders and Otley, in many ways a vanity publication financed by his family, and this marked the beginning of his career as a poet. A lengthy confessional poem, it was intended by its young author to be merely one of a series of works produced by various fictitious versions of himself (the poet, the composer, etc. ), but Browning abandoned the larger project. He was much embarrassed by Pauline in later life, contributing a somewhat contrite preface to the 1868 edition of his Collected Poems asking for his readers' indulgence when reading what in his eyes was practically a piece of juvenilia, before undertaking extensive revisions to the poem in time for the 1888 edition, with the remark "twenty years' endurance of an eyesore seems long enough." In 1835 Browning wrote the lengthy dramatic poem Paracelsus, essentially a series of monologues spoken by the Swiss doctor and alchemist Paracelsus and his colleagues. Published under Browning's own name, in an edition financed by his father, the poem was a small commercial and critical success and gained the notice of Thomas Carlyle, William Wordsworth, and other men of letters, giving him a reputation as a poet of distinguished promise. Around this time the young poet was very much in demand in literary circles for his ready wit and flamboyant sense of style, and he embarked upon two ill-considered ventures: a series of plays for the theater, all of which were dismally unsuccessful and none of which are much remembered today, and Sordello, a very lengthy poem in blank verse on the subject of an obscure feud in medieval northern Italy. Full of obscure references and verbose language, the poem became something of a target for critics' anti-Browning sentiments, and the young poet was made an object of derision and shunned by many of the literati. The effect on Browning's career was catastrophic, and he would not recover his good public standing—and the good sales that accompanied it—until the publication of The Ring and the Book nearly thirty years later. Throughout the early 1840s he continued to publish volumes of plays and shorter poems, under the general series title Bells and Pomegranates. Although the plays, with the exception of Pippa Passes—in many ways more of a dramatic poem than an actual play—are almost entirely forgotten, the volumes of poetry (Dramatic Lyrics, first published in 1842, and 1845's Dramatic Romances and Lyrics) are often considered to be among the poet's best work, containing many of his most well-known poems. Though much admired now, the volumes were largely ignored at the time in the wake of the Sordello debacle. In early 1845 Browning began corresponding with Elizabeth Barrett Browning, a poet in her own right, and the two conducted a secret courtship away from the eyes of her domineering father before marrying in secret in 1846—a union of ideal happiness—by eloping to Italy. Their son, the painter and critic Robert Wiedemann Browning, known to the family as "Pen," was born in Florence in 1849. 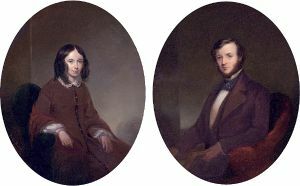 The Brownings continued to write and publish poetry from their Italian home throughout the 1850s, with Elizabeth far overshadowing Robert in both critical and commercial reception. Robert Browning's first published work since marriage was the lengthy religious piece Christmas-Eve and Easter-Day, published in 1850. Men and Women, a series of fifty dramatic poems recited by fifty different fictional and historical characters, with a fifty-first, "One Word More", featuring Browning himself as the narrator and dedicated to his wife, was published in 1855. Men and Women—its title taken from a line in his wife's Sonnets from the Portuguese—is generally considered his most successful collection by modern critics, and many have singled it out as one of the finest books published in Victorian England, but the collection elicited little response when first published and sales remained poor. In the volume's famous last poem, "One Word More," one can distinguish all the characteristic notes of Browning's approach: his simplicity of language, married to his adherent devotion to form. Browning's use of regular meter is strict, at times almost monotonous, but in doing so he also lends the poem (like so many of his long, narrative poems) an engrossing, hypnotic power that thrusts the reader through the verse even if, at times, not everything is clear. In this respect one can recognize one of the qualities that makes Browning a characteristically Victorian poet—the use of sound effects (such as "Her/Her/Her" in stanza III, "Did/Did/Die" in stanza II, and the repetition of "cheek" in stanza I) rather than images or metaphors to give a poem its resounding force. Following Elizabeth's death in 1861, Browning and his son returned to London, while still paying frequent visits to Italy. When his first new work in nine years, Dramatis Personae, was published in 1864, Browning's reputation was undergoing a critical and popular re-evaluation; a collected edition of his poetry published the previous year had sold reasonably well, as had a number of volumes of selected poems. Dramatis Personae was a collection of eighteen poems, many of which were somewhat darker in tone than those found in Men and Women, the central theme again was dramatic poems narrated by historical, literary and fictional characters. The religious controversies of the time, as well as the depiction of marital distress, increasingly came to the fore of Browning's work. Dramatis Personae was the first volume of Browning poetry to sell well enough to merit a second edition, though sales were still hardly spectacular. In 1868 Browning finally completed and published the long blank verse poem The Ring and the Book, which would finally make him rich, famous and successful, and which ensured his critical reputation among the first rank of English poets. Based on a convoluted murder case from 1690s Rome, the poem is composed of twelve volumes, essentially comprising ten lengthy dramatic poems narrated by the various characters in the story showing their individual take on events as they transpire, bookended by an introduction and conclusion by Browning himself. Extraordinarily long even by Browning's own standards (over twenty thousand lines), The Ring and the Book was the poet's most ambitious project and has been hailed as a tour de force of dramatic poetry. Published separately in four volumes from November 1868 through to February 1869, the poem was a huge success both commercially and critically, and finally brought Browning the renown he had sought and deserved for nearly thirty years of work. With his fame and fortune secure, Browning again became the prolific writer he had been at the start of his career. In the remaining twenty years of his life, as well as traveling extensively and frequenting London literary society again, he managed to publish no less than fifteen new volumes. None of these later works gained the popularity of The Ring and the Book, and they are largely unread today. However, Browning's later work has been undergoing a major critical re-evaluation in recent years, and much of it remains of interest for its poetic quality and psychological insight. After a series of long poems published in the early 1870s, of which Fifine at the Fair and Red Cotton Night-Cap Country were the best-received, Browning again turned to shorter poems. The volume Pacchiarotto, and How He Worked in Distemper included a spiteful attack against Browning's critics, especially the later Poet Laureate Alfred Austin. In 1887 Browning produced the major work of his later years, Parleyings with Certain People of Importance In Their Day. It finally presented the poet speaking in his own voice, engaging in a series of dialogs with long-forgotten figures of literary, artistic, and philosophic history. Once more, the Victorian public was baffled by this, and Browning returned to the short, concise lyric for his last volume, Asolando (1889). All links retrieved July 1, 2015. This page was last modified on 1 July 2015, at 22:15.